From the Hancock County Courthouse, go east on Hwys 15/16 for 0.3 mile to the fork at the Sparta Baptist Church. Stay left at the fork and continue on Hwy 16 for a total of 9.9 miles. Turn left on a driveway that runs past a residence. * Go approximately 0.1 mile. The cemetery is just past the power line easement and on the left of the driveway. *The driveway is 0.8 mile past Perry Bell Rd on the left. The graves are numbered starting at the driveway and working side to side in rows. On Dec. 6, 2003, many volunteers, including the Lawson family, members of the Trinity CME Church, and members of Friends of Hancock Co. Cemeteries, cleaned and indexed the cemetery. A headstone with no inscription. On same gravestone as Irena Ficklin Leslie. On same gravestone as George Hillory Leslie. An unreadable funeral home marker is lying on the ground. An elaborate iron marker, somewhat in the shape of a cross, marks the grave. An unreadable funeral home marker. Name per Burnestine Strother, who is her great granddaughter. Grave is surrounded by a cement coping and has a fieldstone headstone. Age 67. w/o Alfred Pitts. She was a loyal friend, a noble daughter, a devoted wife and mother. No death date inscribed. On same headstone as Frank Blount. On same headstone as Emma Kendrick Blount. Thy trials ended, Thy rest is won. 3 graves marked by funeral home markers. Age 96 years. Asleep in Jesus far from thee/ Thy kindred and their graves may be/ But there is still a blessed sleep/ from which none ever wake to weep. 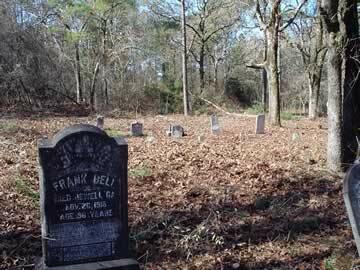 Died Jewell, Ga.
A fieldstone may mark a grave. A blank headstone marks the grave. Identity per Nina Kendrick, her niece. All info per funeral home marker from Augusta. Maiden name per family members. On same gravestone as Welbia Kendrick. On same gravestone as Nina N. Kendrick. "Miss Tena Leslie". Gone but not forgotten. Funeral home marker from Pollard Funeral Home. 3-4 graves identified by fieldstones, depressions, or funeral home marker. Unmarked Grave - Moses (?) Cot ??? Age 74 years. All info per funeral home marker. First three letters of last name may be Cot. First name questionable. A fieldstone headstone and footstone mark the grave. Jesus has come and borne thee home, Beyond the stormy blast. A little time on earth he spent, Till God for him His angel sent. His toils are past, his work is done. He fought, the victory won. Broken stone. Suffer little children to come unto me for such is the Kingdom of heaven. Age 63 years. Weep not he is at rest. Died from a lightning strike. All info per Dessie Wilson, a family member. Identity per Dessie Wilson, family member. A funeral home marker and possible grave at the foot of Anna Dooley's grave. A small granite headstone marks the grave. Rough granite headstone and footstone. Age 84 years. Funeral home marker. Only the age can be clearly read. Age 72. All info per funeral home marker. Both first and last name uncertain. A child-sized slab with handwritten, very difficult to read inscription. Age 84. Death date may have been Jul 8. All info per her granddaughter. Age 60. All info per funeral home marker. Five graves marked by brick headstones. 4-5 possible graves marked by depressions, pottery and a pipe. Some scattered fieldstones and a rough headstone with no markings. w/o Austin Leslie. She is safe in her Father's home above. His soul in Heaven has sought its native place. Age 21 years. Gone but not forgotten. Numerous depressions in this area (the far back of the cemetery).